The renowned Temple of the Six Banyan Trees is one of the most popular attractions in Guangzhou, whose main hall contains the three giant copper Buddhist statues that are the biggest in Guangdong Province. Buddhist relics are enshrined in the Six Banyan Pagoda within the temple. The magnificently Chenโ€�s Ancestral Temple is the best decorated ancient architecture in Guangzhou, exhibiting the exquisite craftsmanship of wood, stone, and brick carving. The famous Yuexiu Park houses the Guangzhou Museum of Fine Arts, Sculpture of the Five Rams, sites of the Ming Dynasty City Wall and Square Cannon and Guangzhou Museum, which contains cultural artifacts that depict over 2000 years of history. Other remarkable places of interest include the picturesque views of lush forests and white clouds surrounding Baiyun Mountain, the stately Sun Yat-sen Memorial Hall and the Museum of The Western Han Dynasty. 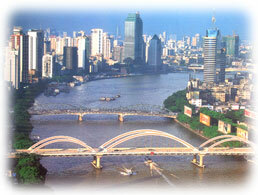 Book your Guangzhou hotel today. V8 Train Station hotel is situated close to the Guangzhou railway station. The Chinese Export Commodities Fair (Liuhua Complex) is only within minutes walking distance from the hotel. Lilac International hotel is situated in the heart of commercial and financial district - Tianhe district. Hotel is only 2 minutes walk from East Railway Station and Subway Station. SaiBao Apartment Hotel is located at the center of the TianHe District, surrounded with universities and Institutes, full of culture and natural environment. The distance from hotel and to TianHe Teemall and East train station is less than 5 kilometres. Lido hotel is located in Beijing Road - the downtown of Guangzhou city with many shops, restaurants nearby. It's about 5 kms away from Guangzhou East Railway Station and about 35 kms from New Baiyun International Airport. The Overseas Chinese hotel is conveniently located not far from the heart of Guangzhou. It is adjacent to the Chinese Export Commodities Fair Centre Liuhua Complex. Canton Hotel is located at the political and commercial center of Guangzhou with Guangzhou Government at the west and Guangdong Goverment at north, and adjoining to walk street of Beijing Road. Hotel Guangdong is located in the downtown area, neighboring the beautiful Yuexiu mountain and the famous Dr. Sun Yat-sen memorial Hall. Guangdong International Hotel is situated at the commercial and financial district of Huanshi Dong Road. It is only 3 km away from the railway station and the China Export Commodities Fair (Liuhua Complex). Donlord International Hotel locates in Tianhe district, one of most prosperous CBD in Guangzhou with easy access to Guangzhou East Railway Station. It is only 15 minutes drive from Pazhou Convention and Exhibition Center, the main exhibition center for Chinese Export Commodities Fair and about 30 minutes from New Baiyun International Airport. Hotel Grand International hotel is ideally located in the heart of Guangzhou's commercial and financial district - Tianhe district, just 5 minutes driving away from Guangzhou East Railway Station and city center.